The Sea Screamer has Day Cruises and Sunset Cruises to enjoy. Journey by beautiful Shell Island and the State Park jetties, then go for a refreshing ride alongside the world's most beautiful beaches and resorts. The Sea Screamer Captain stops at different spots to show you interesting sights along the beach. Fun jumping dolphin and other marine life sightings make the Sea Screamer one of the best adventures of your Florida vacation! Take your hand at the captains wheel. Kids have a load of fun. Ask about our Fun Water Blasters on board!! It never ceases to amaze us how many people take their very first boat ride aboard the Sea Screamer. Boating can be great fun, and with our Experienced and entertaining Captain and Crew aboard, you will see why! We have a blast on the Sea Screamer and have many return riders each year. Bring your Camera to capture your great memories! The Deep-V hull design, combined with the sheer weight of the vessel, allows the Sea Screamer to slice through waves rather than get pounded going over the top of them. This gives a remarkably smooth ride that you won't find anywhere else. 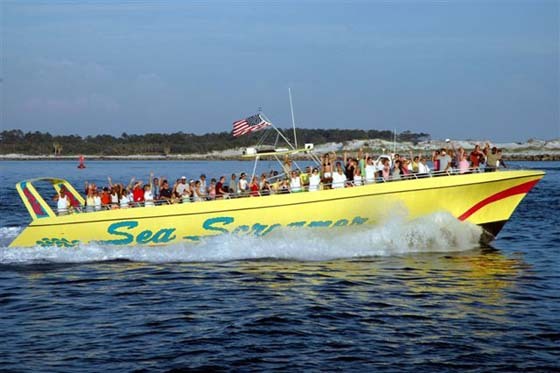 The Sea Screamer is the only sightseeing tour boat here in Panama City Beach that cruises alongside the coastline for a spectacular view of everything for over 8 miles. But ofcourse when the waves are too high along the beach shoreline the captain will take an alternate route beside shell island and around our beautiful waterways, that many passenges have said to be just as excitng and full of scenic adventure.